Flat roofs are becoming increasingly popular. They are most commonly found on commercial properties, such as warehouses and large retail stores. Most homes in Florida have flat roofs on a back porch patio. Flat roofs can develop problems over time. 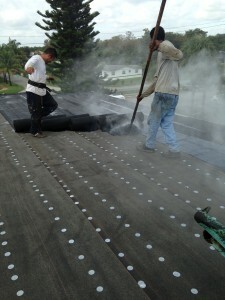 At Preventive Maintenance Support Services, we provide flat roof repair throughout the Boca Raton and surrounding area. Flat roof repairs can be a little complicated, especially if rotten wood needs to be replace. A repair will take a three man crew a full day. 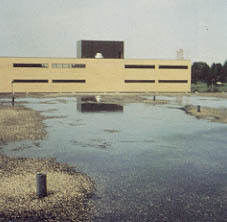 Flat roofs are generally made with asphalt. Many contractor push cold process or torch repairs. 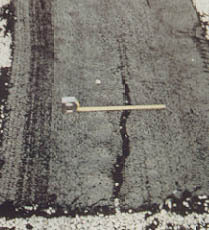 We believe there is no better repair than a conventional hot asphalt repair. Its our experience that anything other than good old fashion hot repair falls short. As with all repairs the damaged roofing materials need to be completely removed and all rotten wood replaced. Our crews are trained to take off as much old roof as needed until they no longer see rotten or water stained wood. New roofing materials are then applied in layers. 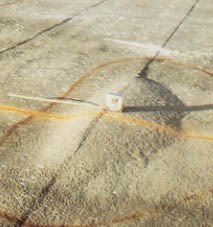 Each layer is placed in hot asphalt. Finally, the perimeter edge of the repair is coated with hot asphalt. If you have a TPO or PVC white reflective roof there are a few techniques we use to ensure a long lasting repair. 1. Identify the plastic modifier in your roofing system. Single ply materials are no compatible. Using TPO on PVC might work initially, but eventually will the patch will eventually fail. 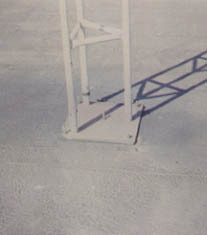 This occurs from a dip in the roof, which may have developed at the time of installation. Ponding can also occur from a fixture on the roof, such as an air conditioning unit. Ponding creates extra weight on your roof, and the water will look for every way possible to seep into your home or commercial building, including the tiniest of cracks on your roof. The first step in fixing a ponding problem is determining the source. Our trained professionals can spot the source quickly and determine the best course of action for repair. A range of factors can contribute to roof blistering. Our roofers will determine the source of blistering and address the problem before it leads to cracking and leaking. Be careful who you allow to inspect roofs with blister. Some unscrupulous contracts will step trying to make new work. If you notice a crack on your roof that is spreading, contact us immediately. Cracks are the main cause of leaks, which can rot your rafters. It doesn’t take long for a crack to become a leak. 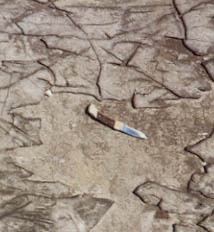 Since water has a tendency to run, a crack that is in one location may not appear as a leak for several feet. While other contractors will simply patch up the cracks, we go steps farther and perform a complete roof repair that removes the damaged sections and replaces them with brand new material. 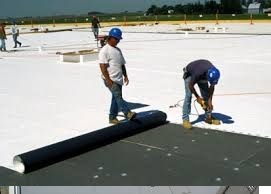 Let our expert flat roof repair crew fix or replace your flat roof. Our quality and prices are unbeatable! Call us today at (561) 586-5655 for a free estimate.